In process control applications, exceedingly close control with PID loops is not always necessary. There can also be instances where location or operational circumstance calls for temperature control, but not necessarily under the control of a centralized system. Self operated mechanical temperature regulators, with their reliable and simple operating scheme, can be well suited for these applications. Self operated temperature regulators are basically valves with self contained actuation controlled by a filled system, or bulb. The valve portion of the assembly controls the flow of a fluid which impacts the process temperature. The process temperature is measured by a fluid filled bulb, connected via a capillary to a chamber containing a diaphragm. As the temperature of the process changes, the fluid in the bulb expands or contracts, changing the fluid pressure on the diaphragm. Pressure on the diaphragm causes movement, which is linked to the sliding gate trim of the valve, thus adjusting fluid flow. A spring provides a counteractive force on the diaphragm and allows for setpoint adjustment. The self contained assembly requires no external power source to operate and requires little maintenance. Proper selection of line size, capillary length, bulb type, and temperature range are key elements in getting the right valve for the job. Application temperature ranges from -20 to +450 degrees Fahrenheit. You can see all the details in the datasheet included below. Share your temperature control and fluid flow challenges with product application specialists, combining you own process expertise with their product application know-how to develop the most effective solutions. 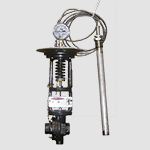 Jordan valve mark 80 self operated temperature regulator from Hile Controls of Alabama, Inc.